Jerry B. Jenkins’s new novel is filled with adventure, drama, historic people and places, and even romance. Empire’s End tells the story of a man who single-handedly turned the Roman Empire on-end. It will be the heart-stopping story of the year! Only a few snapshots of Paul’s life are revealed in the Bible. In this fictional account, Jenkins tells of a devout Jewish scholar, who after only three years in the Arabian wilderness, emerges as the greatest Christian theologian in history. This novel explains how, after supervising the death of Jesus’s disciples, Paul would be moved to effectively conquer the Roman Empire with a message about a Jewish man named Jesus. You’ll be captured by the shocking “thorn in the flesh” that burdened Paul’s heart. Empire’s End will cause you to rethink whether Paul ever experienced the love of a woman or the embrace of a child. Read on. Other than what is written in the Bible, history knows little about the life of Paul. Jerry Jenkins in writing Empire's End has, for lack of a better word, humanized Paul. This book is character driven and it wasn't hard to get to know Paul, his mindset, struggles and convictions. Staying true to the time period it wasn't hard to get immersed in this story, feel the emotions of all those portrayed here. Beginning with the stoning of Stephen it was a time of unrest as those of The Way spread (or tried to) the Good News. Gathering from the scant facts of Saul/Paul's life this is a work of fiction, a big undertaking for the author. My experience with Jerry Jenkins has been his Left Behind Series, which I really enjoyed. His knowledge of his subject matter is consistent and shows the amount of research and his Biblical knowledge. This book is interspersed with a lot of Biblical text, which again is consistent with Paul, the time and his writing. The direction the 'thorn in the side' took was unique and played out nicely. Showing a side of Paul that I never thought of before and I liked it. One of my favorite things to read when I finish any HF novel are the authors notes. It's there that the author gets a chance to say what's real and what isn't. To explain why they changed this or that. There are no authors notes at the end of this book and I was disappointed. 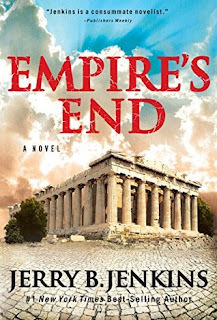 All in all I enjoyed reading this book, I would have liked for the story to have continued and can only hope that there is a sequel in the works.